Maybe... - Nekaro & Co. I don't know what it has been about the month of August. Maybe it was the kids returning to school. Maybe it was all the books I've been reading. Lots of libraries in Kentucky have begun lending books electronically and I've been reading like crazy. Maybe it's because Ro is only taking one two hour nap now. Maybe I've just been lazy. I've been very neglectful of this blog lately, only 7 posts in August!! But it shouldn't take it personally, I've been neglectful with my precious camera lately too. Mostly I think it's because I've been doing a lot of sewing. 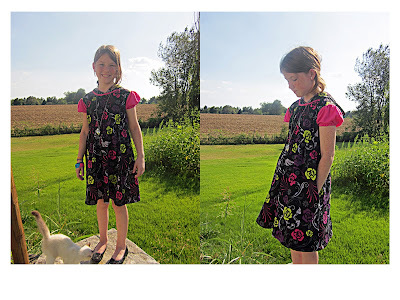 This is one of four dresses I've sewn from 5Berries patterns. This is the Mia dress. It is so easy to make once you've made one. I have fabric cut out for another dress, but just haven't found the time to finish it yet. These are great for Summer because they are easy on, easy off and light and breezy. This pattern is from Go To Patterns. It's the Go To Signature Dress. I can't even begin to tell you how many different dresses you can create with this pattern. 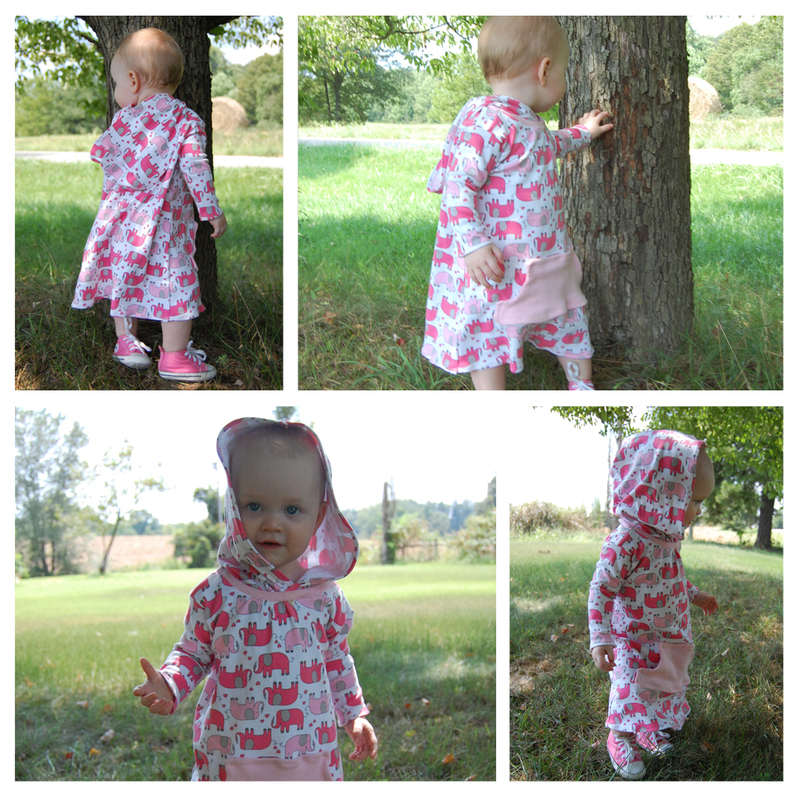 Three lengths, seven sleeve options, four pocket options, with or without hood, and three waist options! Oh and it's also available in sizes 12 months to 12 YEARS! Talk about a pattern that goes a long way! 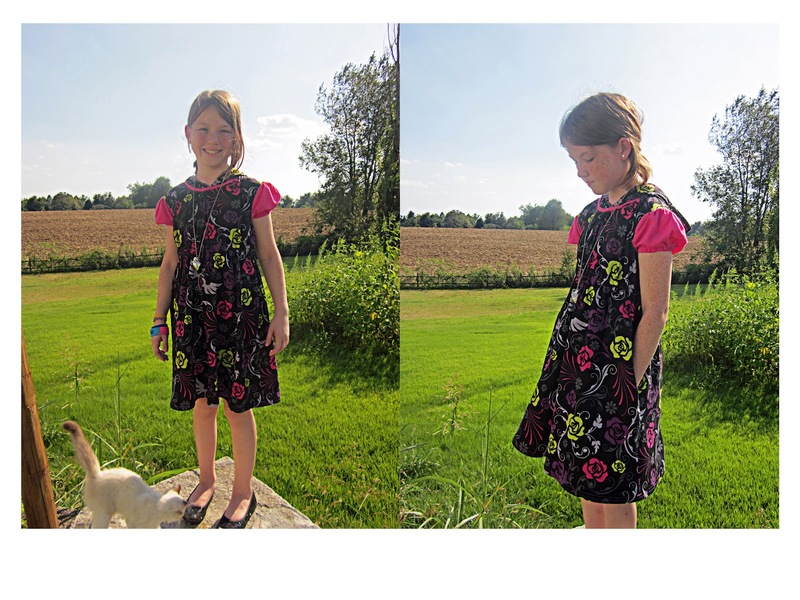 Please excuse the hastily taken photos of the eldest girl, but you see how this pattern is easily adjustable. This was my first time working with knit fabric. I guess I made a mistake by visiting the local Hancock Fabrics store because I paid $12.99 a yard for that cute pink elephant fabric. I'm not the wisest about fabric, but good grief! $12.99 a yard?!? Since it's not the easiest fabric to work with I'm not a huge fan, but I am working with an extremely basic sewing machine and only basic knowledge of sewing. While this pattern CAN be used with a basic sewing machine, I believe that a serger would be an excellent idea. In fact I am currently pining for one myself. The ultimate goal here is to open an online shop. Whether it be through Etsy or my own website, I'm still not sure. It's a big decision and a little pressure, but I need a challenge and some goals. And a paycheck would be super nice too.